Senior Fantasy NASCAR Expert Brian Polking reveals his top 30 drivers heading into the Monster Energy NASCAR Cup Series season! It has been an eventful offseason on the fantasy NASCAR front, and unfortunately, we have to say goodbye to both the Yahoo Fantasy Auto Racing and FOX Fantasy Auto games. Of course, DFS NASCAR is bigger than ever, but there are also still some options out there for anyone looking to play in season-long fantasy NASCAR leagues. NASCAR.com’s Fantasy Live is the most popular option, but I’d also recommend checking out Slingshot Fantasy Auto, a replacement for the FOX game being offered by Fantasy Racing Online. 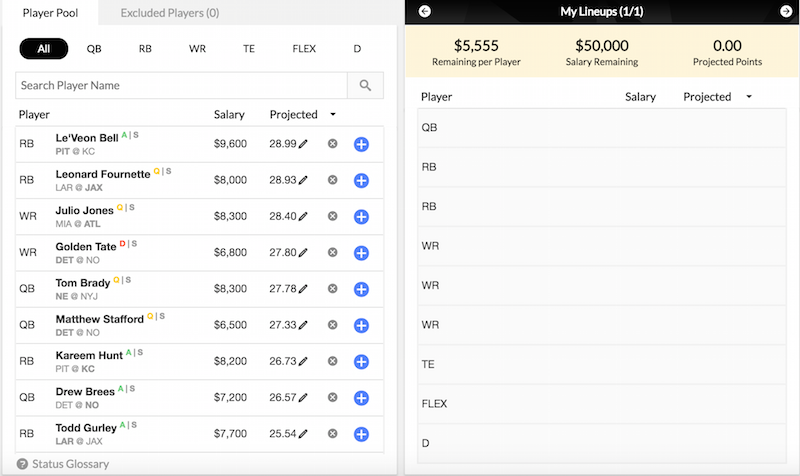 FantasyGames4U offers a salary cap-based, set-it-and-forget-it contest. In years past, I’ve catered my preseason rankings to the Yahoo game, but since that is no longer an option, I’m simply going with an overall Top 30. If you need Fantasy NASCAR advice catered to a specific contest or scoring system, don’t hesitate to reach out to me on our premium forums Twitter or on Twitter at @BPolking. Let’s get ready for the 2018 Monster Energy NASCAR Cup Series season. Kyle Busch: Martin Truex Jr. is coming off an incredible season, but Busch wasn’t too far behind, and Busch has a more extensive track record of delivering elite fantasy seasons in all scoring formats. He finished second in most scoring categories in 2017, and he was within striking distance of Truex in the critical dominator categories – laps led and fastest laps run. Truex may have a slightly higher ceiling, but Busch is the safest bet to finish as a Top 3 option. Martin Truex Jr.: I’m not sure Truex can be as dominant in 2018 as he was in last year’s championship season, but I’m confident he has another year of excellent fantasy production in him. He’s been so fast on the 1.5-mile ovals for the last two seasons, and he led all drivers in every meaningful scoring loop category in 2017. He should be a DFS goldmine once again and one of the top options in all formats. Kevin Harvick: The switch to Ford last year hurt Harvick’s numbers a bit, but he still finished with 23 Top 10s while ranking third in driver rating and average running position. In other words, he is still a virtual lock to finish as a Top 5 fantasy performer in 2018. Harvick is on the short list of drivers who can deliver a solid finish at any track while providing dominator points on a routine basis. Kyle Larson: The breakout year everyone was waiting for finally happened in 2017, and Larson won four races while notching 15 Top 5s and leading more than 1,300 laps. Mechanical issues cost him a shot at the championship, but fantasy owners can welcome Larson to the ranks of the elite. He should be a staple of lineups in all formats, especially those that include the dominator categories in the scoring system. Brad Keselowski: Despite endless complaining about Ford teams being at a disadvantage, Keselowski somehow managed to deliver the rock solid, all-around production fantasy owners have come to expect from him. Pencil him in for multiple wins, at least a dozen Top 5s and 20-plus Top 10s again in 2018. Denny Hamlin: I know he has a tendency to run hot and cold, but Hamlin is coming off one of the best seasons. His 710 laps led were his most since 2012, and his 15 Top 5s and 22 Top 10s were tied for the most in his career. Meanwhile, his 11.6 average finish was the best of his career. With the Toyota teams firing on all cylinders, Hamlin should be a Top 10 fantasy option most of the year with huge upside at flat tracks, short tracks and plate tracks. Chase Elliott: He is still searching for his first win, but Elliott built on an impressive rookie season with across-the-board improvement in 2017. Look for Elliott to finally reach victory lane in 2018, and more importantly, he should make a serious push to becoming a Top 5 fantasy option. Joey Logano: Logano entered the 2017 season as the championship frontrunner, but after having a win at Richmond “encumbered,” his season came off the rails. He didn’t even make the playoffs, and he had his worst season since joining Team Penske. No driver needed the season to end more than Logano. I’ll be taking a wait-and-see approach with him early on, but if he shows signs of returning to his Top 5 form, I won’t hesitate to jump back on the bandwagon. Jimmie Johnson: Although he managed to win the title in 2016 and win three races last year, Johnson is in the middle of the worst stretch of his career. In fact, last year was the worst of his illustrious career, and he finished with just four Top 5s and a 16.8 average finish. Chevrolet’s switch to the Camaro should help some, but it’s time to stop viewing Johnson as an every-week fantasy stud and start using him at a few specific tracks. Erik Jones: His rookie season was a resounding success, and Jones logged 14 Top 10s and nearly went to victory lane at Bristol. Jones began to show Top 5 potential on a routine basis in the second half of the year, and I expect a major leap from him in his sophomore season as he joins Joe Gibbs Racing. Look for Jones to get his first win under his belt, and I think 20-plus Top 10s are within reach. Ryan Blaney: Blaney picked up his first win last year, but he was a bit of a boom-or-bust fantasy option. He finished ninth in driver rating and 11th in average running position, but he also finished with a 17.2 average finish and finished off the lead lap 15 times. There is no denying his high ceiling, and moving to a third team at Team Penske should help him in the consistency department. The 2018 season could be a big one for Blaney. Daniel Suarez: For being unexpectedly thrust into a full-time Cup gig, Suarez held his own as a rookie. He made strides throughout the year, finishing with 12 Top 10s and a 16.2 average finish. His second year with Joe Gibbs Racing should be even better, and although he may still be a year away from being a source of dominator points, Suarez should be a staple of the Top 15 in 2018. Jamie McMurray: McMurray might have been the most underappreciated fantasy option last season. No, he didn’t lead a bunch of laps, but he finished 11th or better in green flag speed, laps in the Top 15, average running position and driver rating. He was also solid at the 1.5-mile ovals. His DFS value will vary from one week to the next depending on his place differential potential, but don’t hesitate to view McMurray as a Top 15 option in season-long formats. Alex Bowman: I may be a little more bullish on Bowman than some, but what he was able to do while subbing for Dale Earnhardt Jr. in 2016 impressed me. He delivered multiple Top 10s and showed Top 5 potential at a few tracks. Heck, he dominated the fall race at Phoenix that year. Now, he gets a chance to drive for Hendrick Motorsports full time, and his experience driving for smaller teams should help his transition. I think Bowman could provide double-digit Top 10s this year, along with occasional dominator points. Kurt Busch: Busch’s 2017 season started with a Daytona 500 win, but overall, he didn’t come close to posting the numbers he provided in 2015 and 2016. In fact, he led just 16 laps and finished 14th in driver rating and 15th in green flag speed. Busch will be back with SHR after some lengthy negotiations, but while he showed flashes of speed late in the year, the lack of consistency is worrisome. I expect Busch to be a Top 15 driver, but I also think he is more likely to disappoint than he is to return to being a Top 10 fantasy option. William Byron: The youngster will be thrust behind the wheel of the iconic No. 24, but he has lived up to the hype at every step of his NASCAR career. Byron won seven races as a rookie in the Truck Series in 2016, and he won four races and the championship as a rookie in the XFINITY Series last season. Multiple race wins as a Cup rookie is asking a bit much, but I think Byron immediately becomes a staple in the top half of the field and starts to earn some Top 10s when he begins to visit tracks for the second time. Clint Bowyer: His first season with Stewart-Haas Racing was a mixed bag. Bowyer had his best season since 2013, but he didn’t win a race and missed the playoffs. He finished the year with a 15.5 average finish, and at the very least, he should be able to match that in 2018 while remaining a strong fantasy option at short tracks and road courses. I think this is his fantasy floor. Aric Almirola: A back injury cost him seven races in 2017, but Almirola managed an 18.8 average finish when he was behind the wheel. More importantly, he landed a premier ride with Stewart-Haas Racing this offseason, and Almirola will have his first opportunity to show what he can do in elite equipment. For a driver who has made a career of staying out of trouble and finishing in the Top 20, I expect the equipment upgrade to lead a career year in terms of consistency and Top 10s. No, I don’t expect him to suddenly become a fantasy juggernaut, but Almirola should be a borderline Top 15 performer, and he could be underpriced in a lot of formats, especially early in the year. Ryan Newman: He isn’t a guy who is going to help you out in the dominator categories very often, but Newman is one of the best at salvaging decent finishes. Despite struggling at the intermediate ovals in 2017, he still finished with a 15.8 average finish overall. He typically isn’t a great DFS option, but Newman’s ability to consistently challenge for Top 15s makes him an underrated option in season-long, points-based leagues. Austin Dillon: Don’t let his fuel mileage win in the Coca-Cola 600 fool you, Dillon took a big step backwards in 2017. His Top 10s fell from 13 in 2016 to just four, and his average finish went from a career-best 15.9 to 18.6. Dillon believes Richard Childress Racing downsizing to a two-car operation will be a benefit, but I recommend a wait-and-see approach with him early in the year. He has never shown signs of being able to provide help in the dominator categories, and I’m skeptical that he can be more than a mid-pack performer. Kasey Kahne: Kahne’s disappointing tenure with Hendrick Motorsports came to an end last season, and he will join Leavine Family Racing to drive the No. 95 Chevrolet in 2018. His team will have a technical alliance with Richard Childress Racing, but if Kahne couldn’t run up front consistently with HMS, I don’t expect a sudden resurgence with the No. 95 team. I do think a change of scenery and less pressure could allow him to exceed expectations normally associated with a smaller-budget, single-car team, but I think his ceiling is a steady dose of Top 20s with occasional Top 15s. Ricky Stenhouse Jr.: He cemented himself as one of the premier superspeedway drivers in the series with wins at Talladega and Daytona in 2017, but he was a hit-and-miss fantasy option elsewhere. Stenhouse did manage a career-best 17.1 average finish in 2017, but I don’t expect much of a leap as long as he is with Roush Fenway Racing. Outside of the plate tracks and Bristol, he isn’t a driver you have to go out of the way to fit into your lineups. Darrell Wallace Jr.: Wallace will begin his first full-time season at the Cup level after a respectable four-race showing in the No. 43 last year while subbing for Aric Almirola. He posted a 17.8 average finish in those starts, and with the team’s offseason shift to Chevrolet and newly formed technical alliance with Richard Childress Racing, I think “Bubba” can challenge for Top 20s on a routine basis in 2018. If he is priced on the cheaper side at DraftKings and Fantasy Live, I think Wallace could be a sneaky fantasy option this season. Trevor Bayne: He has essentially been the same driver the last two years, posting five top 10s and a 19.9 average finish in 2016 and six Top 10s and a 19.5 average finish last season. Bayne showed some serious sleeper appeal at Bristol in 2017, but a Top 15 finish is a great day at a majority of the other tracks. He can provide cap relief in DFS contests, but he is a low-upside fantasy option. Paul Menard: Menard has been the picture of mediocrity, and his 19.6 average finish last year was right in line with his 20.6 career mark. I actually think leaving Richard Childress Racing for Wood Brothers Racing is an upgrade in terms of equipment, but even at his best, he is a Top 20 driver who only has value at a few tracks. Ty Dillon: His rookie season wasn’t terrible, but while Dillon’s 20.7 average finish was decent, he also finished with zero Top 10s. He may make slight improvements in 2018, but driving for Germain Racing is going to continue to limit his upside. Dillon should be one of the safer, low-priced plays in DFS formats and Fantasy Live, but he is still a mid-pack driver. Chris Buescher: Buescher’s move to JTG Daugherty Racing helped boost his week-to-week performance, but he didn’t make the jump I was expecting. He finished the year with four Top 10s and a 21.4 average finish. He will have occasional value as a cheap DFS play, but that’s about it. A.J. Allmendinger: The 2017 season proved to be a tough one for Allmendinger, and he saw his average finish fall from 17.8 in 2016 to 22.0. Consistency at the intermediate ovals continues to elude him, severely capping his overall value. His road course skills give him elite upside at Sonoma at Watkins Glen, and he has also been a useful sleeper at the plate tracks and Martinsville. Michael McDowell: McDowell leaves Leavine Family Racing for Front Row Motorsports in 2018, and overall, it is probably a slight downgrade in equipment. I still expect him to challenge for Top 25 finishes on a consistent basis, but I don’t think he will be able to match his 22.2 average finish from a year ago when he was the top driver from the lower-budget teams. In terms of fantasy value, McDowell can be considered a sleeper at road courses and plate tracks in most formats, and he should be a useful low-priced DFS play at times. David Ragan: He will be back with Front Row Motorsports in 2018 after posting a 24.9 average finish with the organization last year. FRM will have a closer alliance with Roush Fenway Racing this year, but I don’t expect that to provide much of a boost in his performance. Ragan is likely to have some appeal as a punt play in DFS contests, but in most formats, his value is limited to the plate tracks. Ragan is a former winner at both Daytona at Talladega, and he managed three Top 10s in four plate races last season. Join ScoutDFS.com and receive DFS content from our team of experts: Steve Renner, Fuego Steve, Jaguar Lou, Nate Weitzer, Shawn Childs, Dr. Roto & Adam Ronis… If you choose an optimizer plan, we have optimizers for every major sport based on our Rainman Data Analytics (RDA) that work for DraftKings, FanDuel and Yahoo. All of this is yours via a Scout DFS subscription. What are you waiting for? The best deals in the industry are waiting for you at ScoutDFS!